The marine ecosystem around the Antarctic Peninsula is experiencing dramatic warming (Vaughn et al. 2003) and significant reductions in the extent and duration of seasonal sea ice cover (Stammerjohn et al. 2008). These changes affect every component of the ecosystem (Schofield et al. 2010, Ducklow et al. 2012), but particularly the demography and ecology of Antarctic krill (Euphausia superba) and the predators that rely on krill as their primary prey. The life history and population dynamics of krill are heavily influenced by climate forcing (Nicol 2006), thus krill predators must respond to both seasonal and inter-annual variability in prey availability and alter their behavior and demography in response to such changes (e.g. penguins and seals; Fraser et al. 1992, Reid and Croxall 2001, Fraser and Hofmann 2003, Reid et al. 2005). The largest krill predators found in the nearshore waters around the Antarctic Peninsula are humpback whales (Megaptera novaeangliae). Since the cessation of commercial whaling, these whales have recovered quickly and are now the most numerous baleen whale species in the region. Previous work by our group has shown that the broad-scale distribution patterns of these whales is mostly related to areas with increased krill abundance (Friedlaender et al. 2006, 2011), and that seasonal movement patterns of the whales seem to be linked with offshore to onshore movement patterns of krill from summer to fall (Figure 2, Curtice et al. 2015). More recent work is providing greater insights regarding how the density (Figure 3, Johnston et al. in review) and foraging behavior (Friedlaender et al. 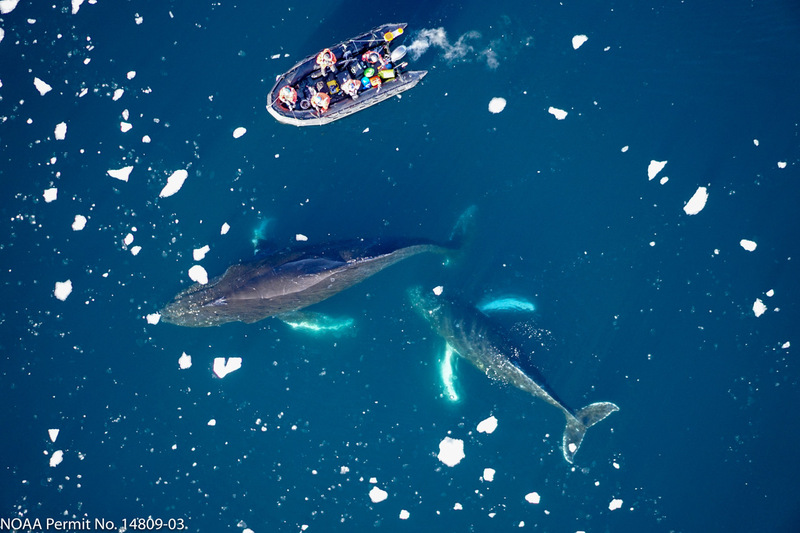 2013, accepted) of these whales reflects the broad-scale distribution of resources and environmental conditions around the Antarctic Peninsula. Because of their enormous size, humpback whales have high energetic demands that can only be met by foraging on high-density prey patches (e.g. Goldbogen et al. 2010). As a result, humpback whales distribute themselves and move between areas of increased prey abundance throughout the Antarctic feeding season. Antarctic krill predators that are tied to land or sea ice as a substrate to provision young and rest (e.g. penguins and seals) are susceptible to local changes in the availability of prey. Seasonal changes in krill availability can therefore have significant consequences on the survival of these central-place foragers. Baleen whales, however, are more mobile and able to find prey across a much broader spatial and temporal scale. However, because of their increased energetic demands relative to smaller animals, whales require high densities of krill. Much like commercial fishing is more efficient in areas with high densities of targeted resources, baleen whales seek areas of high krill availability (e.g. Nowacek et al. 2011, Johnston et al. 2012). It is therefore imperative to understand the areas in which whales forage and how these areas overlap with existing fishing grounds (in both space and time) so that proper management and conservation strategies can be implemented. Whales, penguins, and krill will be studied by scientists from five different countries as thanks to grants awarded to three groups of researchers by the Antarctic Wildlife Research Fund (AWR). As recipients of these first AWR research grants, Dr. Ari S. Friedlaender (Oregon State University) and Dr. David W. Johnston (Duke University) will conduct a long-term ecological study on the foraging behavior of humpback whales around the Antarctic Peninsula, focusing on how critical foraging areas relate to historic catches of krill in the region. The stated aims of the Antarctic Wildlife Research Fund (AWR) include development of a management system for the Antarctic krill fishery, monitoring reference areas for indications of long-term change, and designing field and analytical methods to provide indicators of ecological change and their causes. We believe that a long-term program aimed at studying the movement patterns and foraging behavior of the largest krill predators in the Antarctic (baleen whales) can satisfy all of these objectives. Our research group has in-place the logistical support to conduct a long-term ecological study on the foraging behavior of humpback whales around the Antarctic Peninsula, and specifically how critical foraging areas relate to historic catches of krill in the region. In this proposal, we outline an initial study that would use a combination of robust ecological analyses to define the foraging range of humpback whales around the Antarctic Peninsula across broad spatio-temporal scales, and model the amount of overlap between these areas and those where the krill fishery has historically operated. 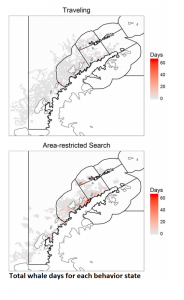 The objectives of our proposed research are to: (1) leverage an existing data set of satellite tracks to define the spatial and temporal use patterns of humpback whales around the Antarctic Peninsula, (2) add significant data to test ecological hypotheses using state-space modeling techniques about specific areas where whales forage throughout the feeding season, and (3) generate spatial overlap estimates between whale foraging regions and locations of historic commercial krill catches. In combination, these analyses will provide a quantitative perspective on the foraging ecology of the largest krill predator (and most abundant whale species) in the nearshore waters around the Antarctic Peninsula. With respect to the research goals of the AWR, we are confident that our proposed research represents a unique opportunity to study the potential overlap between whales and the krill fishery. We are using new modeling techniques to quantify the movement patterns and habitat use of humpback whales around the Antarctic Peninsula. With support from the AWR we will be able to dedicate significant time to performing analyses on a large data set of previously tagged whales and would incorporate new data from 2016. The use of state-space models allow us to determine not only the movement paths of whales, but also to define portions of these paths where whales are foraging versus simply transiting. This fundamental step forward will provide us with a far more robust means for characterizing the physical environmental features that promote increased whale feeding. 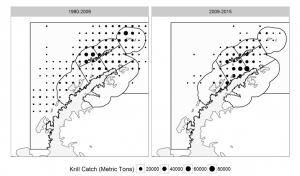 However, with the addition of historic krill catches from the region, we can specifically quantify if, when, where, and to what extent commercial fishing effort and humpback whale feeding co-occur. This information is critical for managing both the amount and location of fishing effort while also providing useful information on the biology and ecology of these top predators in a changing environment. 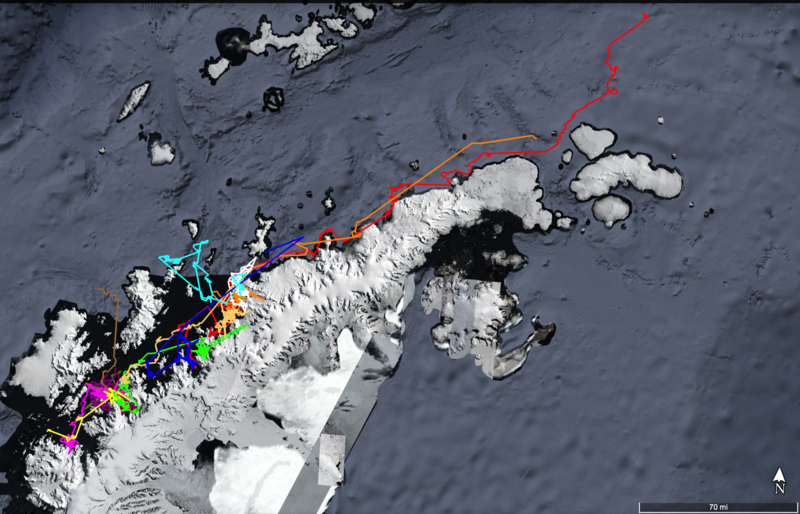 We will produce a rigorous analysis of humpback whale foraging ecology at broad spatio-temporal scales around the Antarctic Peninsula in relation to areas of krill catches. Specifically, we will determine areas of high foraging activity and relative density, and the amount of spatial overlap with historic commercial krill catches. This information can address the potential for interactions between whales and industry. 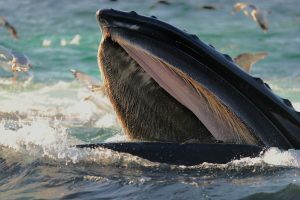 As the largest krill predators, baleen whales require the greatest densities of prey to support their energetic demands and thus, areas where they forage intensively will elucidate regions of enhanced krill availability critical for individual health and population growth. A total of 14 humpback whales were tagged with Mark10 and SPOT 6 tags during the OneOcean and Minke cruises this January and February. Daily activities consisted of working from small boats to search for whales to tag and/or to recover tags previously deployed. During this time the LMG conducted prey mapping surveys and/or CTD/net tows for environmental sampling. This work was made possible through the generosity of the Hogwarts Running Club.